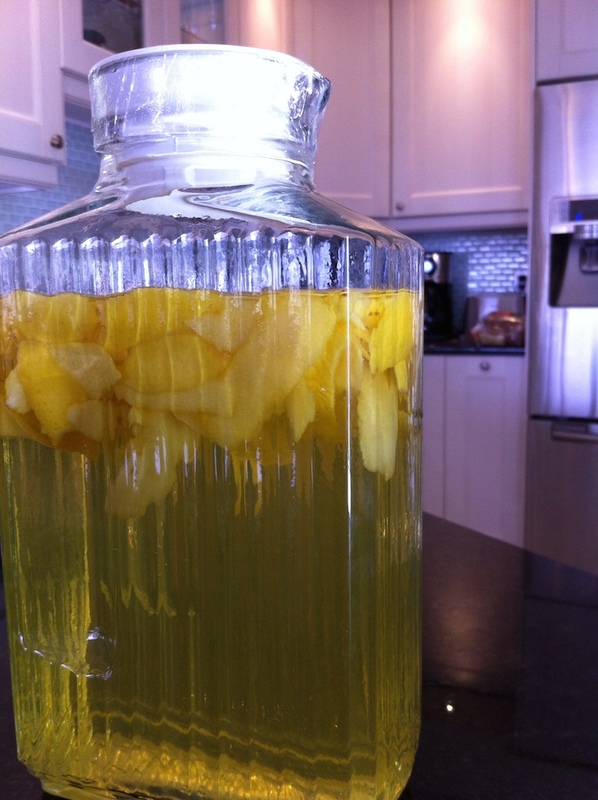 Limoncello : Make it a Top Shelf treat ! Summer is here, and it’s time for some summer libation ! One of my recent loves is Limoncello. It’s just so good. Add it to iced tea for your best ‘Arnold Palmer’ ever! My brand of choice is just sweet enough, but not gooey sweet – some can be like a ‘lemon schnapps’ – yuck! 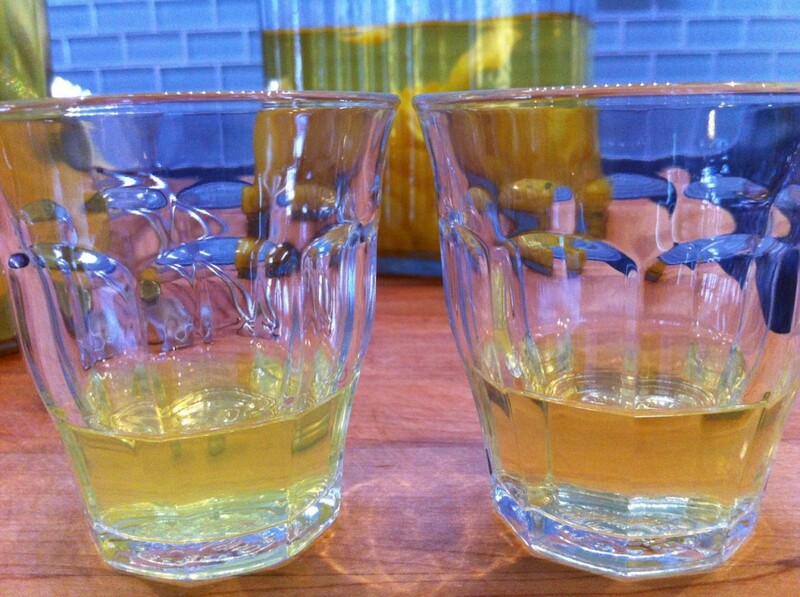 The thing that makes limoncello different is that it’s made from the peels or zest of the fruit, not the sour juice. I’ve been buying it for years and one day got a bug in my bonnet to see what’s in the stuff. What I found was mainly, ‘mystery grain alcohol’ and Food Dye #5, and of course lemon peels. Well, after a bit more research I discovered that one of my favorite Italian cooks makes her own. ‘gasp’ – Giada, I love you even more!! Yes, I buy her cookbooks and used to watch her shows, because I have rarely been disappointed by her recipes and tips. Everything tastes wonderful and is really pretty healthy. When I read the reviews of her recipe I couldn’t wait to try it. Once you read this, you’ll be doing it too. * You’ll need this later for a simple syrup. But it still makes the ‘ingredient’ list. Wash those lemons! Dawn and hot water will melt off the wax…and pesticides. 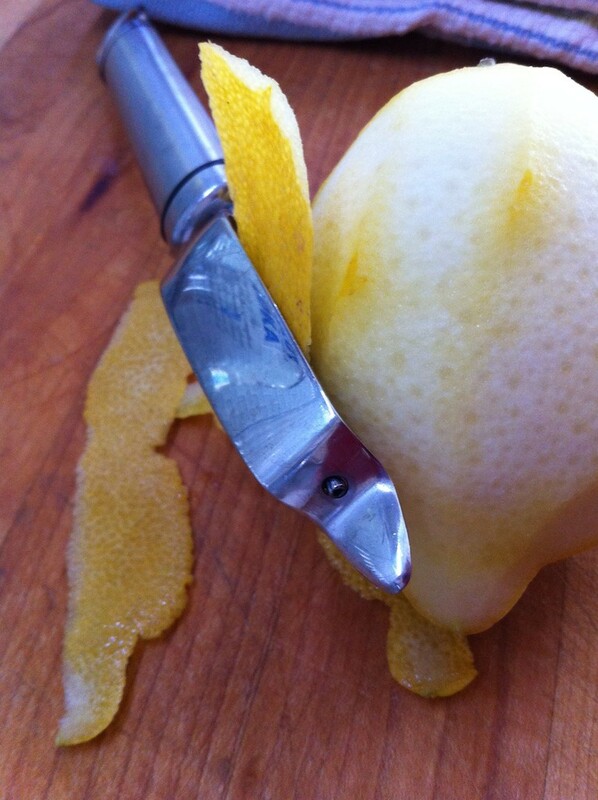 Using a vegetable peeler, peel the zest off the lemons. Try not to get the bitter pith underneath. 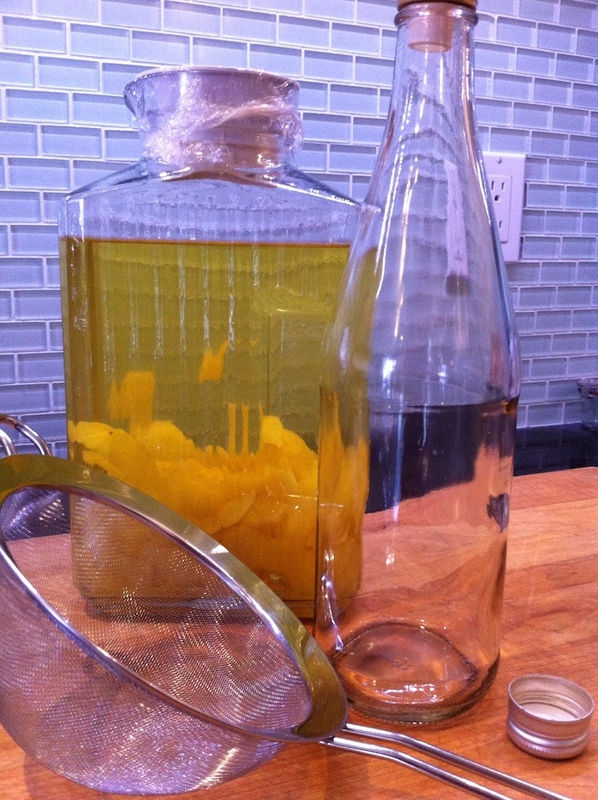 Pour the vodka over the peels, lid tightly, and set aside to steep for 4 days. 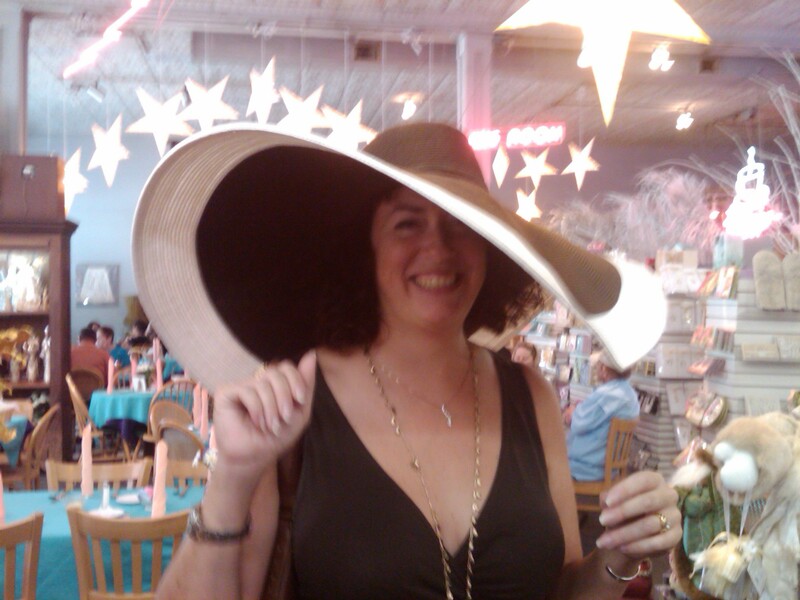 …and later that week. Make the simple syrup by heating the water and sugar to dissolve. Let it cool to room temp and add to the pitcher. Let the sugar/water and lemon peel mixture steep at room temp overnight. Just look at that color ! Who needs Food Dye #5 !!? Strain out the peels and bottle. I got two 750 ml bottles out of my batch. I found that a glass bottle of sparkling water made for a great re-use, as well as my empty bottle of store-bought limoncello. I had just a shot of my store bought variety leftover to compare mine to, and I actually like mine better. The DIY version has a much more fresh and clean lemony taste…not so much ‘lemon Pledge’. Since it’s made with relatively good vodka, I know I won’t be left with a massive headache in the morning! 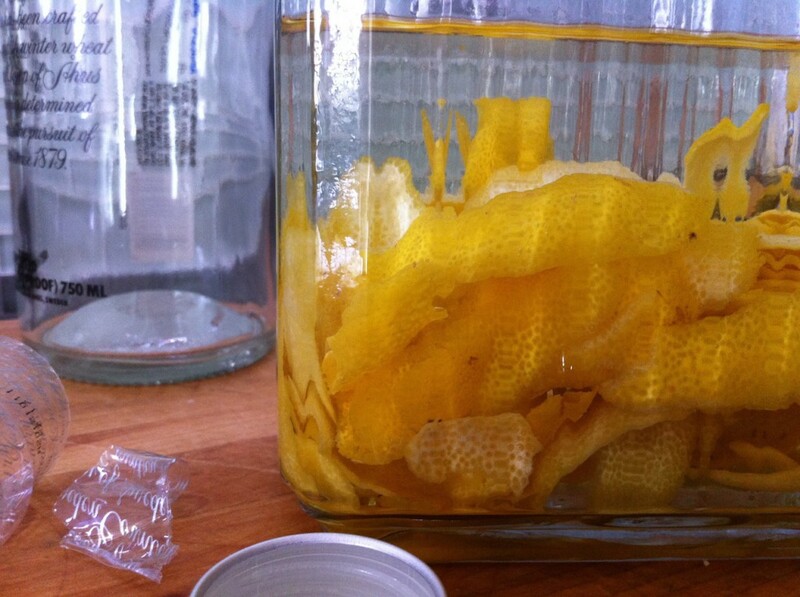 I checked a site devoted to this summer sipping syrup (limoncelloquest.com), and he used finely grated zest and let it ferment/steep in Everclear for 45 days, and double filtered it…! What?! Everclear? Oh, no – that stuff is reserved for Hunch-Punch and that’s it…or if you run out of gas in your car. What I really liked about his post, was seeing how he compared one brand against another and what makes a good limoncello. (To him anyway, he seems a bit obsessed – that’s ok, I get it) I have to believe that mine would stack up nicely on his chart. I took a bottle to Perfect for a family picnic and it was a hit. I’m glad the recipe made 2 bottles. A day of Lemon Drops (lemon martinis) and it was a history. Everyone that tried it was impressed. The next day, I was floating in the pool with a glass of LaCroix mineral water and Limoncello. Refreshing, relaxing and sort of good for me? So, get some lemons and some patience and go for it! 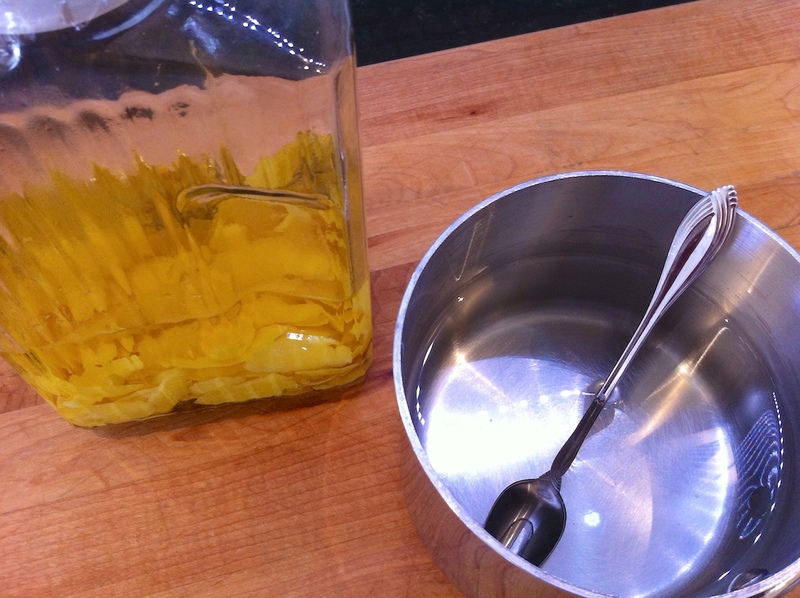 DIY Limoncello : make yours TopShelf worthy! Wash those lemons. Peel off the zest thinly. 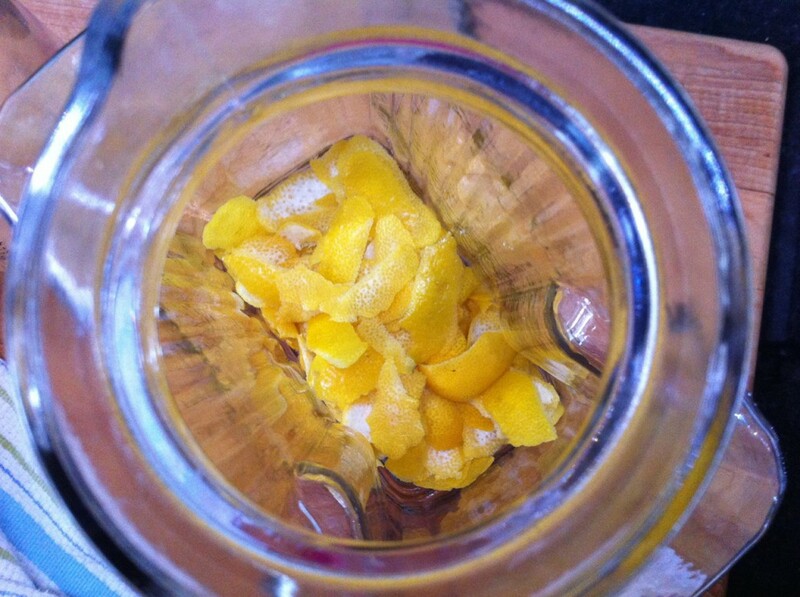 In a 2qt pitcher, add lemon peels. Pour in vodka. Cover and steep at room temp for 4 days. Make simple syrup by heating sugar and water to dissolve. Cool to room temp and add to pitcher. Strain out the peels and bottle. Most recipes call for a 'grain alcohol', but that gives me a headache. I like wheat based vodkas, which include GreyGoose and Absolut...I'll save the GreyGoose for martinis though. Use what YOU like and enjoy thoroughly ! 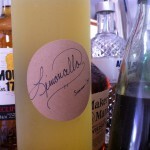 2 Comments on Limoncello : Make it a Top Shelf treat ! FYI, vodka and grain alcohol are essentially the same thing (actually, most liquors start as varying strengths of pure grain alcohol that is either aged in wood or flavored). Vodka’s grade is directly related to how many distillations it has (to get the grain taste/residue out). High grade ones are brought to almost pure alcohol and then diluted to proof. 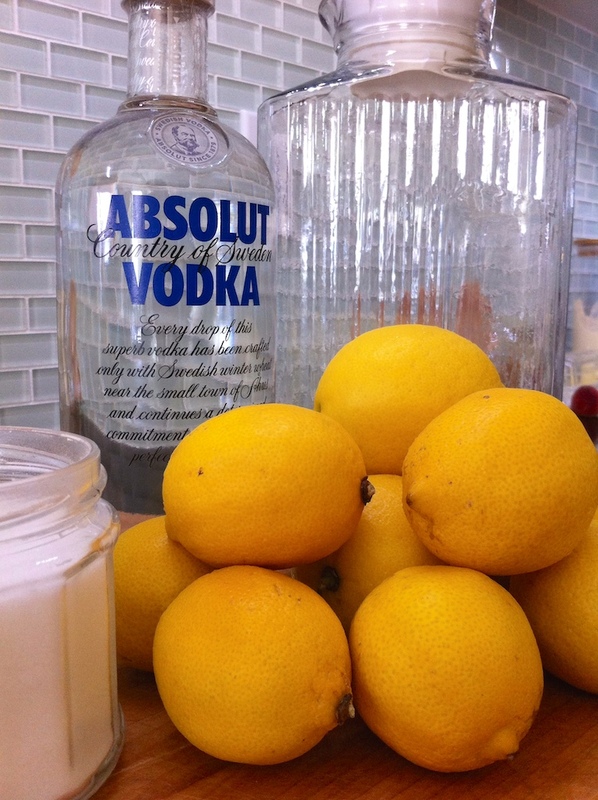 Absolut is not a very high grade vodka, but it’s fine for making liqueurs. You’re right – there are way better vodkas out there. I love being able to have a choice in what’s in my limoncello. There’s no telling what the commercial bottles are actually made from. Thanks for reading – hope you’re enjoying your own versions of limoncello.